Back in January, on New Years Day to be exact, I did a "Black women in Fashion" post paying homage to the well developed black women in the Fashion industry. As the industry keeps progressing in its diversity, I came up with a new list of black women I follow on social media who I've grown to respect and continue to be inspired by... Right in time for #WCW (Women Crush Wednesday). As a black woman trying to get into the industry, I can not stress how important I think it is to follow along with women just like you who have not only done exceptionally well in the industry but also are in the same, if not, similar positions that you wish to have in the future. There's nothing I admire more than women who 'make it look easy' and lets be real, when is it ever easy for a black girl?! Though I haven't put my whole foot through the door, doing research on women you inspire to be like, or even just respect can really help increase your drive and motivation. Tamu McPherson is someone I discovered while I was looking at street style photos during fashion month around 2013 (ish). I was so in love with her sense of style. It was something I never seen before. It was a mixture of polished, structured and fun. I could immediately tell that she did not live in New York City. So of course I had to do my research! Turns out Tamu was born in Jamaica and moved to New York (which explains her style). She became an attorney but later on in life she started to work for fashion. She moved to Milan and started doing street style for magazines. Through taking street style photos she started her street style blog all-theprettybirds.com. I admire Tamu for her immaculate sense of style, positivity and her ability to capture the essence of fashion through a camera (and her instagram). She inspires young women like me to continue to be expressive. I discovered this gem recently while looking at New York Fashion Week Street Style photos. I was automatically drawn to her style: her messy hair and my ability to easily sense her own individuality through her non-practical yet chic ensembles. I can tell that just like me, she loves to try new things. Not to mention, her Instagram is pretty interesting: a mix of humor and style. 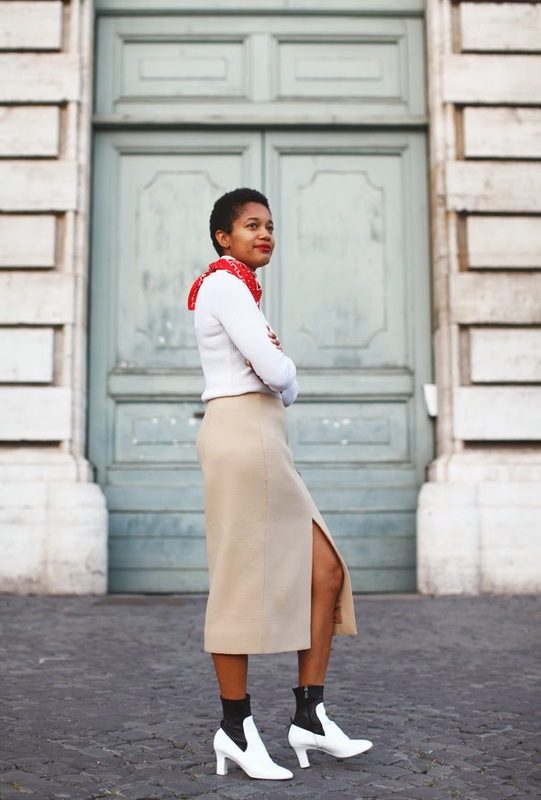 Now the editor of Elle.com, Danielle Prescod has had quite a journey. According to the Teen Vogue site, she scored her first internship at the age of eighteen at Nylon Magazine, she then interned at Teen Vogue which later led to her being the accessories market assistant and also at Interview as their market assistant. Not to mention her last job as fashion editor at Moda Operandi. I'm actually glad I looked Danielle up because her path has really motivated me (secretly I also want to be a fashion editor), and though the job is not glamorous (i mean,what job in fashion is?!) it is exciting to be able to contribute to something so amazing as writing (and styling) for a magazine that for years have impacted young women's lives. I know, seems a bit cheesy to put it that way, but that's how I feel. I am trying to pinpoint exactly when I discovered Elaine, but I'll tell you this, her voluminous, bouncy and curly hair drew my attention. I automatically knew that I had to find out who she was and what her job was in the industry. Coming across yet another magazine editor, I felt like I scored yet another gem and of course, I had to look more into her. She is currently the beauty and health director at Teen Vogue but before, her past gigs involved being a beauty and style editor for Ebony Magazine , beauty writer and editor at Glamour Magazine and later being promoted to senior beauty editor (still at Glamour Magazine). Pretty impressive right? On the inspirational scale, through watching her and former online beauty editor Phillip Picardi's videos on the Teen vogue YouTube, I obtained so much knowledge through their beauty tips which lead to my comeback to using makeup. Surprisingly, I have not regretted it! As usual on the day-to-day basis, I continue to follow along with Elaine's journey through following her on Instagram. It's incredibly refreshing! So what was the point of this article? I wanted to share one of my many source of inspirations that constantly keeps me moving on my journey. I have a whole lot of things to learn and improve; keeping in close contact with people who I respect and admire (via social media) really helps me not only improve my craft but sharpen my attitude and work ethic so when I enter the work field (well in my case, as an intern) I can excel at what I do. I know, that may also sound a bit practical but it works for me! What are some of your goals? What are some things that help you stay inspired and motivated? Jeans - Try to visit www.robecart.com they have nice shoes, handbags, dresses and accessories too! Gucci - Try to visit www.robecart.com they have nice jeans, shoes, handbags, dresses and accessories too! You have a unique personal style!